Industrial water chillers are available with a choice of two types of refrigerant condensers: Water-Cooled or Air-Cooled. It is important to choose the right type of condensing medium for the environment the water chiller will operate in. 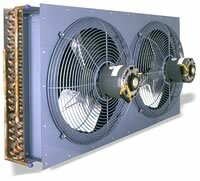 Ill suited condensers may affect process cooling and thus affect production quality. Refrigerant condensers are necessary to remove latent heat from the high pressure refrigerant gas. This heat is introduced by the compressor. The condenser is an heat exchanger where refrigerant gas flows on one side and the condensing medium (air or water) flows on the other side. The latent heat from the refrigerant gas is transferred to the condensing medium. As the heat is transferred to the condensing medium, the refrigerant gas cools and “condenses” into a liquid. Low temperature liquid refrigerant is required to chill the process water. A basic example is where the facilities that do not have adequate water supplies from tower or city water supplies will find that an air-Cooled condenser is better suited than a water-cooled condenser because an air-cooled condenser does not require an external water supply. These condensers use a tube and shell heat exchanger where plant waster circulates on one side and refrigerant on the other. These condensers use a fined tubed heat exchanger and motor driven fans or centrifugal blowers to move air through the condenser. Selection criteria are listed below as well as the Advantages and Disadvantage of each condenser type. Advantage can help with condenser selection and recommend if an air-cooled or water-cooled condenser is best suited for your industrial environment. Adequate water supplies are available from tower, city or well sources. Water supply is of good quality. Heat recovery is not practical or unimportant. Plant ambient temperatures consistently exceed 95°F. Ambient air is polluted with large dust and dirt particles. Operates more efficiently on hot summer days. Does not offer summer ventilation. Adequate water supply not available from tower or well sources. Water supply is not of good quality. Heat recovery is practical and important. Plant ambient temperature will not consistently 95°F. Ambient air is not polluted with large dust and dirt particles. Somewhat more costly to purchase and operate. Gives less cooling on hot summer days. Offers summer ventilation and winter supplement heating. Would you like to Download FYI #110 to your browser?